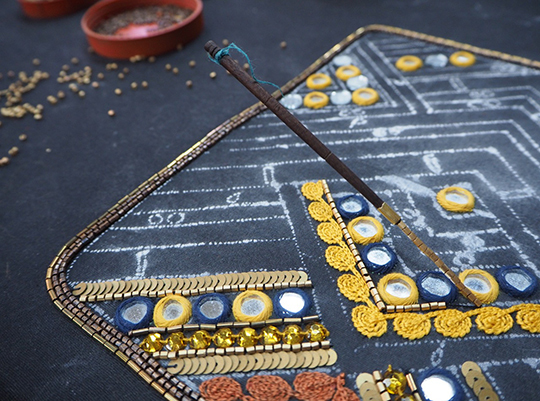 My recent trip to India was mostly to learn about block printing, but I couldn't travel there without taking a peek at a centuries-old tradition that India has probably been even more well-known for – its embroidery. I was fortunate to be able to visit a modern workshop in Noida, about an hour from Delhi, that embroiders for large international clothing chains. I wasn't quite sure what type of place I was going to before my visit, but it was fascinating to see all these old techniques still being used in service of brands we'd wear today. Samples are produced in the workshop from designs provided by the fashion houses. It's then a matter of getting a similar outcome in the most cost-effective way. 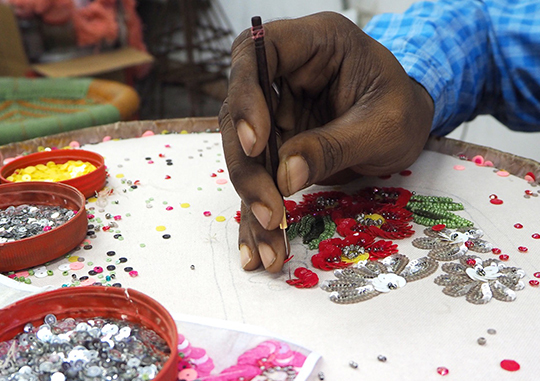 Once the fashion house signs off on the sample, the work goes to a production house further out of Delhi in the countryside. All the embroidery was done with an aari needle, pictured above and below. As far as I can tell it's very similar to a tambour needle, but doesn't have a detachable needle section. You can see in the pic below that it's loaded up with beads ready to go. Coincidentally the V&A are currently showing an extensive exhibition of Indian textiles (jealous!) so I was pootling around their website and came across this short clip of Indian fashion designer Manish Arora's studio, which also happens to be in Noida. Not only that, the studio set-up is very similar and it shows the aari needle in action, as well as being a complete feast for the eyes – enjoy! On my last day in Delhi I went to the National Museum to see their small collection of textiles. The pieces are all behind glass, so my photography isn't great, but at least photos were allowed here, unlike the National Crafts Museum. The collection at the craft museum is simply mind-blowing. They have a huge range of textiles from all over the country. I couldn't help myself and went back for a second visit. It's a shame however, that the textile gallery has almost no lighting – I'm sure it's to protect the pieces and they don't have the money to do it any other way – and very little in the way of labelling to describe what you're looking at. Despite this, if you can find a guide who knows what they're talking about and can take you there, it's so worth seeing. Actually even if you don't have a guide it's still worth seeing! Anyway, let's get on to what I can show you. 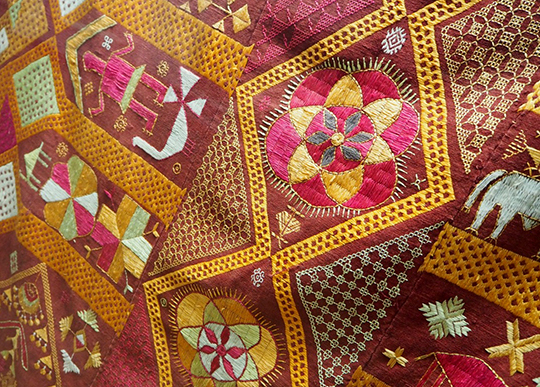 The first, is an example of phulkari embroidery. It's from the Punjab region, and literally means 'flower work'. Most of the examples I saw were in orange and hot pink, sometimes with white included. I've added other pictures of all the types of work I'm showing you to my 'Textile Travels – India' Pinterest page if you want to check out more examples. Next, is embroidery from the Kutch region of Gujarat. This example is made up of tiny chain stitches, so I'd imagine it was produced with the aari needle again. Lots of bright colours are the norm and it's also the type of embroidery where you'd expect to see the small shisha mirrors sewn in. Apparently before the use of mirrors, they often used beetle wings, and I saw a few examples of this in museums in both Delhi and Jaipur. They were a shiny green-ish black. The photo below was taken at the Anokhi Museum of Handprinting in Jaipur. At first I thought it was an example of appliqué – which I did see quite a bit of in India – but on closer inspection, it's resist-dyed fabric with kantha quilting. 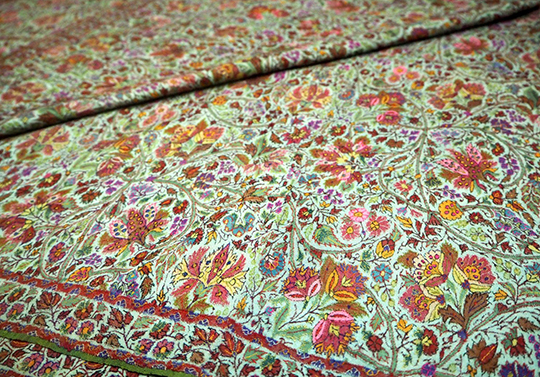 Kantha is the quilted embroidery of Bengal and north-east India and in sanskrit the word means 'rags'. Similar to the 'boro' textiles of Japan. These examples were a modern take on traditional techniques. 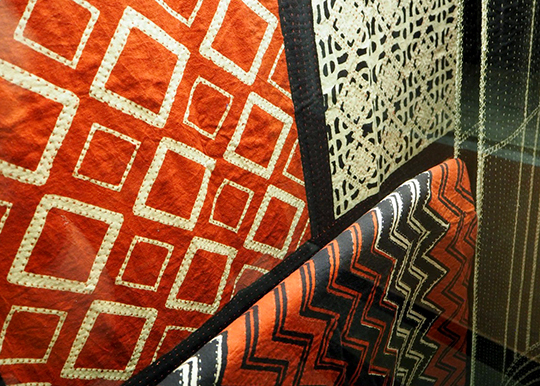 Last, but not least are the textiles of Kashmir. There are two types of shawls the Kashmiris are famous for. The first is the kani, or loom-woven shawl. Pictured below is a dorukha, (double-sided) example, where the front is almost indistinguishable from the reverse. If you look really closely you can see there is a stitched layer over the entire shawl (the red outlining the green leaves near the bottom right corner, for example). It takes years to complete a piece such as this, and I just can't get my head around how complex it must be to weave. 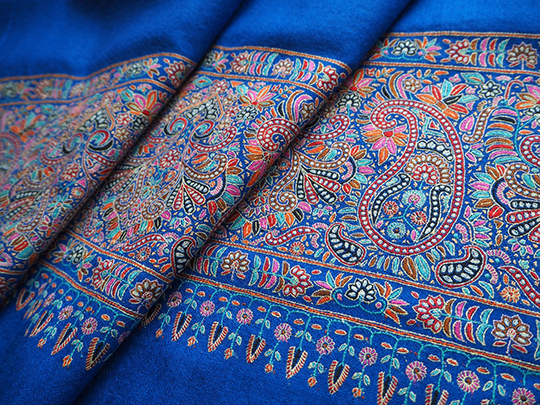 The second type of shawl is a sozni. These are hand-embroidered on a plain base, and this beauty came home with me. The ones with the all-over embroidery, while completely stunning, were the price of a small car, so I obviously went for something less detailed. While the kani are usually the more highly prized shawls, it's the embroidery, rather than the weaving, that I really love. 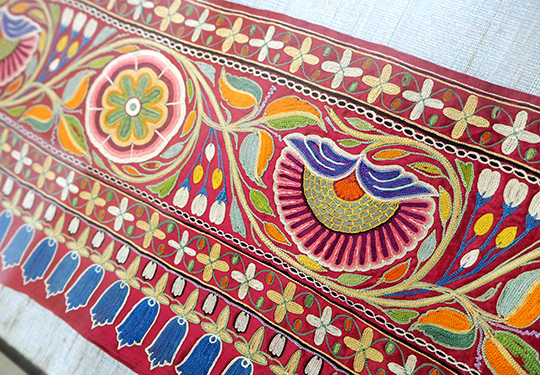 Such a tiny taste of Indian embroidery… I think all it's done is made me want to do another trip so I can learn more! So many textile traditions, so little time. What amazing embroidery! And what an opportunity to visit India! Oh it was – on both counts Julie! I was very lucky to be able to see and experience it all.